PORT ROYAL, Pa. – Lucas Wolfe made it back to back triumphs in the Port Royal Speedway Bob Weikert Memorial for 410 sprint cars on Sunday night, scoring his second win in a row in the prestigious race, earning $10,000 for the big win. In the Northeast Ultimate Super Late Model Series feature, York’s Rick Eckert completed a clean sweep of weekend late model action at the track, scoring a convincing win in the 35-lap main that paid $5,000 to win. Polesitter Dylan Cisney jumped into the lead over second starter Logan Wagner at the start of the 30-lap Bob Weikert Memorial for the sprint cars and was holding sway on the lightning-fast track when the first caution flag of the race unfurled with four laps completed for the stopped racer of Anthony Macri. The restart saw Cisney maintain control as he hooked the cushion in every turn to maintain his advantage. With 10 laps in, Cisney was holding a .836 second lead over Wagner and Wolfe with Lance Dewease running fourth. Cisney then hit traffic and that really bunched the front of the field up as Wagner narrowed the gap by lap 13 all the while having Wolfe, Dewease and David Gravel within one turn as all five cars battled for control at the same time. Wagner was able to slip by Cisney in the second turn on the 14th tour but then Cisney attempted a comeback that also lost him second as Wagner crossed the stripe with a .194 second lead over Wolfe. Cisney then regrouped and reclaimed second from Wolfe during the dizzying, high-speed dance at the front that was being spun off between all five front runners. The breathtaking and dizzying pace between all five was slowed with 17 away when Cory Haas stopped on the backstretch. But with eight laps to go, his dreams of victory went over a cliff when his left rear tire disintegrated, handing the lead to Wolfe with Cisney second followed by Dewease, Gravel and Brock Zearfoss. Dewease pounced on the low side on the restart and set Cisney back a spot before trying just to keep the leader in sight. And then Cisney burst a left rear with four laps to go, again bunching the field. Dewease was never able to challenge over the final four circuits as Wolfe drove away on the restart. Wolfe took his eighth career Port Royal win by 1.264 seconds over Dewease, Gravel, Zearfoss and Ryan Smith. Sixth through 10th went to Danny Dietrich, Greg Hodnett, Trey Starks, Brent Marks and Freddie Rahmer. Heats went to Mike Wagner, Cisney, Steve Buckwalter and Dietrich with Jared Esh taking the consolation. Fast time was set by Greg Hodnett with a lap of 15.234 seconds, an average speed of 126.829 mph. Rick Eckert would lead all 35 laps of the super late model main, chased by Jeff Rine throughout. The race was riddled with caution flags including on laps one, three, nine, 14 and 16. Eckert started second in the race with Rine starting third and Rine got around Gene Knaub for second on the lap one restart. For the first half of the race, Rine seemed to have a chance at the win as Eckert allowed him to close in around the corners but during the second half of the race, especially through traffic starting on lap 25, Eckert poured on the power and speed to take his sixth career Port Royal win by seven seconds flat. Ross Robinson and 20th starter Kyle Lee raced hard for third during the final 10 laps with Robinson holding on to the spot at the finish. 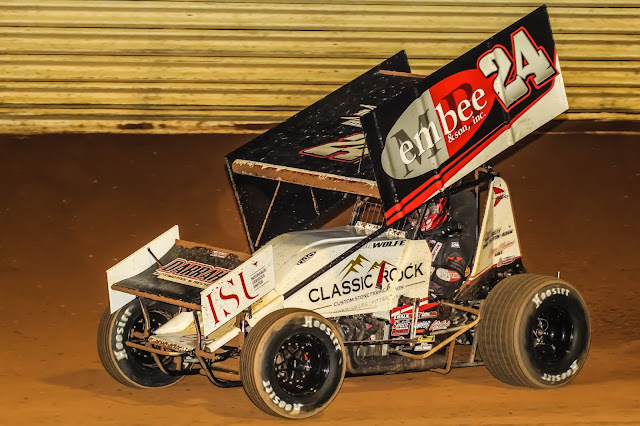 Lee’s massive run from the back netted him fourth with Donny Schatz finishing fifth. Sixth through 10th went to Matt Cosner, Dan Stone, Dylan Yoder, Gary Stuhler and Ryan Montgomery. Heats went to Eckert, Rine and Robinson with Dan Stone winning the consolation race. Fast time was set by Eckert with a lap of 17.677 seconds.